The bars tasted fine and for the most part, I like the ingredient list. However, I did not like the following: tapioca syrup and tapioca maltodextrin. These are names of processed sugars that I don’t think need to be in plant based bars. I bought 2 boxes so I could try the variety and thought the green bar would be a good option. However, I probably won’t buy them again. I purchased my Blendtec Total Blender at Costco during a demo at the store. The demo guy recommended I go online to GreenSmoothieGirl .com for great recipes and support. Since I have been drinking the green smoothie, my bowels are more regular than they have ever been. I was diagnosed with Irritable Bowel Syndrome and now I do not have constipation. It is the most wonderful feeling to be regular! Also, since adding the dark leafy green vegetables, I have been able to avoid colds from grandkids and friends. I can honestly say I am much healthier. I never miss a day and it has been about 4 months. The green drink is the best breakfast a person could have. I was diagnosed with breast cancer in 1999. I had a surgery to remove the lump but refused chemo and radiation. I saw a naturopathic doctor and through micro water, stabilizing my PH, and diet, was able to get rid of it. In the spring of 2008 I knew from the symptoms the cancer was back. I checked my pH, which was so acidic it wouldn’t even read on the paper. I went to see my doctor and he confirmed the readings. I knew the key to getting rid of cancer was a balanced pH. I have a microwater machine, but I knew the fastest way to balance pH is through greens, but it was impossible to eat the amount that I needed. I’ve been drinking blended greens faithfully since August of 2008 along with the raw food, no dairy, no meat. I was rechecked for cancer in January and there are no signs at all*. I feel great, haven’t been sick. I’ve lost weight and am back down to my high school weight and size. I have energy, etc. . . I could go on and on. My kids can’t believe I’m running around chasing the grandkids like a teenager. The green drink is the best breakfast a person could have. Because of the positive change in me, about 10 other people have started drinking green smoothies. Ladies at Curves, my husband, my daughter, my husbands’ parents, my parents, and my friends. And when I go to Sunflower Market, I meet a lot of people, mostly older people buying kale for their green drink. I smile and think, wow, that’s great! We’ve been converted to green smoothies for a while now. In fact, I’ll have to say that I crave them. Not necessarily the taste (although our concoction is very tasty), but the effects they have on me! I feel so much healthier and my skin tone has definitely improved. People tell me I look so young–who doesn’t like to hear that?! My daughter and grandson are hooked now, too. Thanks Robyn! I drink a quart of an all-vegetable green smoothie every day. I have more energy, sleep better, wake up ready for the day, and generally feel much better. I believe it’s because of the green smoothie and a whole foods diet, mostly raw. I have cut out all processed foods, sugar, and caffeine, and I feel great! Thanks for your website; it’s very informative and inspiring! I’m a 32 year old mother of a 5, 4, and 2 year old. I’ve neglected my own health over the last 5 years while caring for them. I stumbled across the GreenSmoothieGirl Detox right at the perfect time. I had reached the point where I was 50-60 lbs overweight and just out of excuses, why I couldn’t take time to take care of myself. I started at Level 1 as a Lifetime Member, followed Robyn’s menu plan to the letter (although I skipped a few meals because, amazingly, I wasn’t hungry! 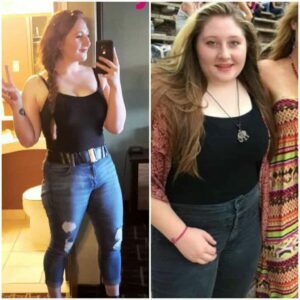 )–and I lost a total of 23.8 lbs, 5.25″ in my waist, and 3″ in my hips! I have also embarrassingly struggled with hormonal/cystic acne constantly since I was 12–and one of my miracles is that my skin is now clear! This was exactly the kickstart I needed to regain control of my health. THANK YOU, Robyn Openshaw! I look forward to repeating the detox in the future and already have family members wanting join me! It’s amazing what we can do when we simply put our MINDS to it! I am so in love with green smoothies! I am so in love with green smoothies! I am a 31 yr. old mother of four children. I am very into fitness/weight lifting to build muscle in my body. I started green smoothies just after I had been referred to GreenSmoothieGirl.com by my zoning lady for chronic headaches and muscle tension in my neck that would not go away. Soon after I started drinking green smoothies daily, the headaches and muscle tension left! I have not had the problem since. I drink green smoothies for breakfast along with a whey protein shake every morning, and also for my snacks during the day, I make a full pitcher of green smoothie every 2-3 days and keep it in my fridge when I need a snack. It is quick and easy and very healthy! It keeps me on track for my ideal weight goals! I have converted many friends and family to green smoothies! I recommend them to everyone I meet! When someone asks me what I am doing to look so good, I just give them my personal green smoothie recipe and some fitness tips! I would like to thank Robyn for this AWESOME idea and for taking the steps to get the information on her website to help others who so desperately need a nutritious lifestyle! We Have So Much More Energy Now! Instead of Craving Sugar, I Crave Green Smoothies! I had a great experience doing the GSG Detox. I was scared to sign up because I knew how bad my eating habits had been and that I had a major sugar addiction to kick. A friend of mine decided to sign up with me and then my spouse ended up doing the detox with me, so that buddy system really took away that fear and made the experience fun! It’s great that there is a buddy assigned to those who don’t have one. The Forum was the other priceless gem. I can’t tell you how valuable it was to read what other people were experiencing, have the option to ask ANY question, and have constant feedback from Robyn, the GSG staff, and any member who wants to comment! You become a community, which I already miss very much! This is the reason why I just signed up for the lifetime membership. The support is there; you are never alone! Doing the GSG Detox was a challenge, that’s for sure, but the benefits are so worth the work! I lost a total of 13 lbs., my spouse lost 11 lbs., and my buddy lost 15 lbs. doing the detox and we are all still losing weight, which is great! We all agree that we have so much more energy now! I am happy to say that instead of craving sugar, I actually crave a green smoothies now! Thank you for all your hard work, Robyn and GSG staff—YOU’RE THE BEST!!! My son was in one of Robyn’s university classes last year, and she had the class members over to her home for green smoothies. He thought it was fabulous and phoned me and wanted me to sign up for 12 Steps to Whole Foods. We were already not eating soda, caffeine, white flour or sugar, etc. and made our own salad dressing, ate meat and dairy sparingly, and ate salad and vegetables daily. We began drinking smoothies immediately, both green (Ch. 1) and hot pink (Ch. 10), and it has been over a year now and we continue to do this on a daily basis. I always have spinach and vary the greens, such as kale; red, green, or rainbow chard; different types of kale; or collard greens. I also vary the fruits seasonally. My husband and I immediately felt as if we had more energy and many days I have a green smoothie for breakfast and a pink smoothie for lunch. I have passed the information to many friends and family members and was especially interested in the program to help educate our children and grandchildren. Many are following the program, having purchased blenders and have green smoothies on a daily basis. As Robyn states, people are healthier, sickness is avoided, meals are easy to prepare, and family members are happy and satisfied. My friends who have children who are gluten intolerant have really been appreciative of the information that has been passed on to them — they feel that it is very hard to come up with food choices that are satisfying. Some are college students and one mother said that the smoothies would be such a blessing during this busy time of their lives. From 12 Steps, I learned about not eating soy — we were drinking soy milk and having tofu occasionally and have eliminated it completely. I also was unaware of coconut water, coconut oil, and flax oil, which we purchase and store and use daily. Per Robyn’s blog, I use it as a moisturizer on face and skin. I also learned about alkaline water and hope to have a system soon. We were using filtered water but now see the benefit of making more changes. I also learned about kefir and use goat’s milk kefir since cow’s milk is very mucous forming to me. I like all of the recipes I have tried and have learned that by looking at Robyn’s, I can easily adapt many of my own recipes and make them healthier. The chapter on gardening is wonderful to help us expand our abilities and be self sufficient through home production and storage. We often have house guests and many take Robyn’s book, The Green Smoothies Diet, as they retire to their room. I always have requests of “Could we have that for breakfast?” This weekend a professor is here from a university who will be speaking at a management society meeting and he already has heard of green smoothies and is eager to take it to his wife who only prepares organic foods for her family. He asked for the website and wants to learn of this new aspect of nutrition. I cannot end without expressing gratitude. Many years ago my little brother who was 8 at the time gave me a small calendar with beautiful quotes for Christmas. One was a Chinese proverb that GRATITUDE has three forms: a feeling in the heart, an expression in words, and a giving in return. Please know of the profound feelings of gratitude, Robyn, for all that you have done and continue to do, and know that words cannot properly express my gratitude for the gift you have given to so many, and may we extend our gift of friendship, support to you, and prayers as you continue to expand our horizons.